The integrated POS is a well-designed, secure and fully equipped checkout solution. Specifically designed for tablets, it is the perfect solution to leverage your existing payment assets while answering the needs of connected small merchants. With the integrated POS, Ingenico is providing a universal platform to easily deploy a complete point-of-sale solution. 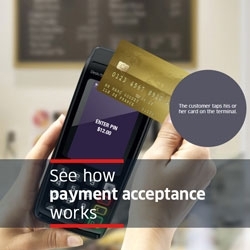 Specifically designed for tablets, it is the perfect solution to leverage your existing payment assets while answering the needs of connected small merchants.